It has oft been said, and by far wiser heads than mine, that just because you can do something, doesn’t necessarily mean you should. That axiom could well be applied to Disney and its current mania for remaking its animated films as live-action epics, a strategy which makes sense in one way since why not leverage all that animated treasure for a whole library of dramatic cinema, but completely doesn’t in quite another, given that it’s an approach reeking of creative laziness and rampant lack of imagination. In the case of Dumbo, the latest film off this conveyor belt of been-there, done-that, based on the 1941 animated classic and helmed by Tim Burton, the result is a film that charms and delights to a point but feels like everything you have ever seen before, despite bearing little to no narrative similarities to its almost 80-year-old predecessor. Given its heart on its sleeve sensibilities, it feels almost brutalist to not embrace the film with the same childlike fervour that circus kids Milly Farrier (Nico Parker) and her brother Joe (Finley Hobbins) do when little Dumbo is borne to an Indian elephant recently-purchased by ringmaster and owner of the Medici Brothers’ Circus Max Medici (Danny Devito in fine form). 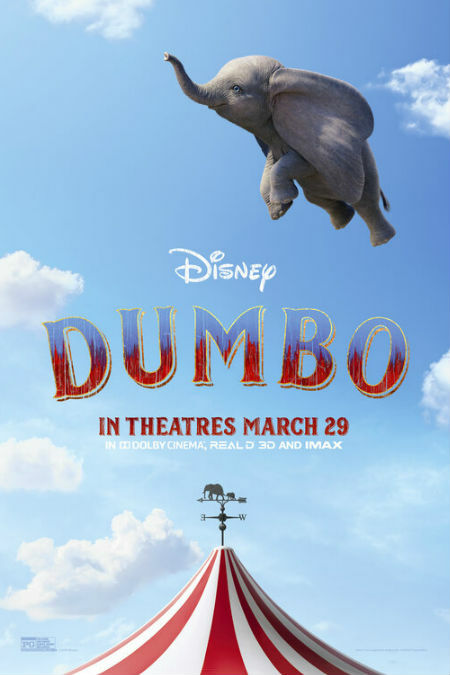 After all, Dumbo is all alone in the world after his mother is returned to her former owner, largely on account of her big-eared offspring whom Max initially sees as an abnormal burden, mocked by crowds, disliked by some of the circus folk and ignored by recently-returned veteran Holt (Colin Farrell) and father of Milly and Joe who resents losing his glamorous role as a horse act rider and the circus’s glamourously-handsome lead star. That we are meant to feel deeply sorry for Dumbo, and fall in love with him the way Milly and Joe do, is obvious; it’s not just the story pushing us in that direction, it’s the CGI-engendered, dew-eyed innocence of Dumbo himself who you can’t help but fall in love with. And fall in love you do, although much of that attachment is squandered by a story that, surprisingly for someone of Tim Burton’s usually ferally-gothic imagination, is very much a connect-the-dots, tick-the-boxes affair. You can’t necessarily blame Burton for this anodyne saccharine feel to proceedings. After all, he didn’t write the film – that dubious honour falls to Ehren Krugerwho clearly was under orders to fill the big top with as many cliches and well-worn tropes as possible – and Disney is a hard taskmaster at the best of times, but even so, there’s nary a sense that Burton was anywhere near the film. It feels far too safe, and while that doesn’t make it a bad film, it makes it feel very unadventurous and unimaginative, a cobbling together of all the us-against-the-world storylines that have ever existed in cinema or elsewhere for that matter. You won’t be surprised to learn that the film ends happily too, every duck in a row and justice prevailing moment served up on a satisfying platter, a conclusion so neatly sealed up that it’s tempting to like the film simply because it offers up the kind of closure that you normally have to pry out of the cold dead hands of real life. Dumbo is happy, the kids and Holt are happy (and in love with French trapeze performer Colette, played by Eva Green, the easily-arrived replacement for Holt’s flu-despatched beloved wife), Max is happy, and the baddy of the piece, V. A. Vandervere, played with phone-it-in, Vaudevillian flair by Michael Keaton, give his fiery just desserts. What’s not to like, likely think Disney. 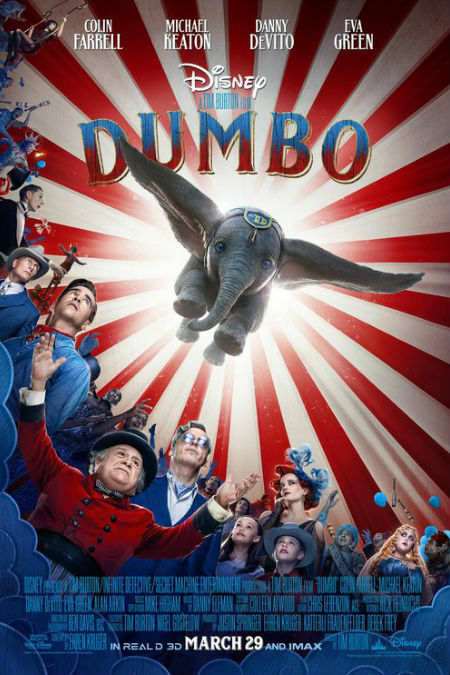 And on the surface, at least, not much – Dumbo is lovably adorable, everyone who has been wronged is righted, the world is set back on axis of goodness and righteousness and all the evils of the world that we can usually not escape has been left behind in the existential dust. 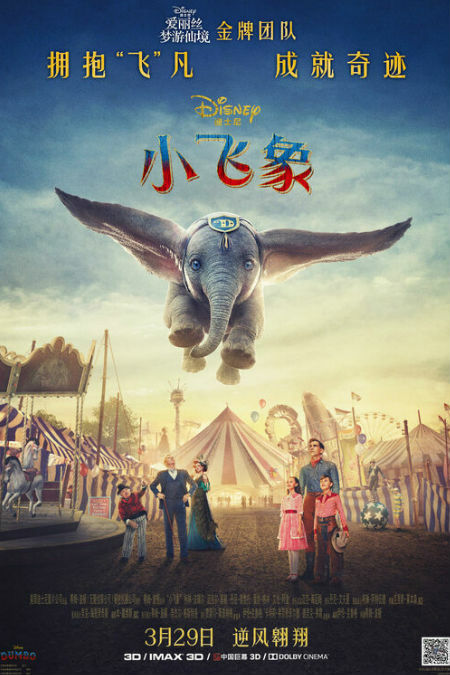 Yet for all this uplifting warmth and wonder, and visuals that bring the 1919-era circus to life with gorgeously-rustic splendour, Dumbo feels curiously hollow. It has all the right moving parts, the narrative is more than fit for hackneyed purpose, the protagonist is vindicated, his otherness kicked to the curb like so much bigoted rubbish, and we are left feeling as things couldn’t possibly get any better, but as you walk out of the cinema, it hits you that there is very little of anything left behind in the cinematic aftertaste. Much like fairy floss dissolving on your tongue mere seconds after its tantalisingly-sugary arrival, Dumbo has disappeared into the ether, a warm glow that seems to have no appreciable reason for existing at all. It’s a pity really because done well, and the 1941 animated take on the story was done superbly well, this is a story with a lot of grit, pain and substance to it, as well as fittingly, a great deal of hope and restitution. These themes are all present and accounted for in the 2019 remake, and in their own superficially-engaging way – again this is a hard film to hate; but to feel involved with? Ah, that’s another thing entirely – they have the desired effect. But it’s shallow, ephemeral and before you can stick a feather in Dumbo’s trunk (one of the constants from the first feature, along with the mouse) and sending soaring to the upper regions of the big top and out into the beckoning heavens where a longed-for reconciliation with his mother lies just beyond his reach, it’s up and gone, a pleasant enough diversion but lacking any real staying power and presence.